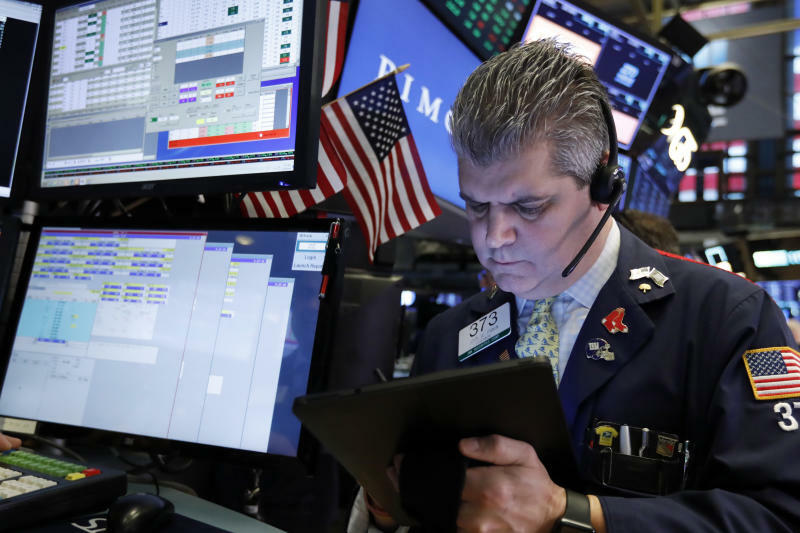 TOKYO (AP) -- Asian shares were mostly lower Friday after a slide on Wall Street as investors nervously watched the U.S.-China trade talks in Washington. Japan's benchmark Nikkei 225 slipped 0.5 percent to 21,368.54 in morning trading. Australia's S&P/ASX 200 gained 0.5 percent to 6,170.30. South Korea's Kospi fell 0.4 percent to 2,220.12. Hong Kong's Hang Seng lost 0.6 percent to 28,446.32, while the Shanghai Composite shed 0.4 percent to 2,742.10. Health care and energy companies led U.S. stocks lower. The S&P 500, which has risen for the past three weeks, fell 9.82 points, or 0.4 percent, to 2,774.88. The Dow Jones Industrial Average lost 103.81 points, or 0.4 percent, to 25,850.63. The Nasdaq composite declined 29.36 points, or 0.4 percent, to 7,459.71. The Russell 2000 index of smaller companies gave up 6.11 points, or 0.4 percent, to 1,575.55. The world's two biggest economies are locked in a trade war after President Donald Trump alleged that China deploys predatory tactics to try to overtake U.S. technological dominance. Beijing's unfair tactics, trade analysts agree, include pressuring American companies to hand over trade secrets and in some cases stealing them outright. The Trump administration has warned it will increase its import taxes on $200 billion in Chinese goods from 10 percent to 25 percent if the two sides haven't reached a resolution by March 2. But Trump in recent days has signaled a willingness to extend the deadline if negotiators are making progress. "The trade talks do appear to have made some progress, however, but a run of weak data from Japan, Europe and the U.S. yesterday took the wind out of the equity market sails," said Jeffrey Halley, senior market analyst at OANDA. ENERGY: Benchmark U.S. crude fell 10 cents to $56.86 a barrel. It slid 0.3 percent to settle at $56.96 a barrel in New York. Brent crude, used to price international oils, slid 14 cents to $66.93 a barrel. CURRENCIES: The dollar inched down to 110.72 yen from 110.82 yen on Thursday. The euro weakened to $1.1335 from $1.1341.